When Steve Jobs introduced the iPad on Wednesday, his live demonstrations with the device clearly showed the Safari browser was not capable of playing Adobe Flash. However, promotional images on Apple's Web site show that same content loading just fine. 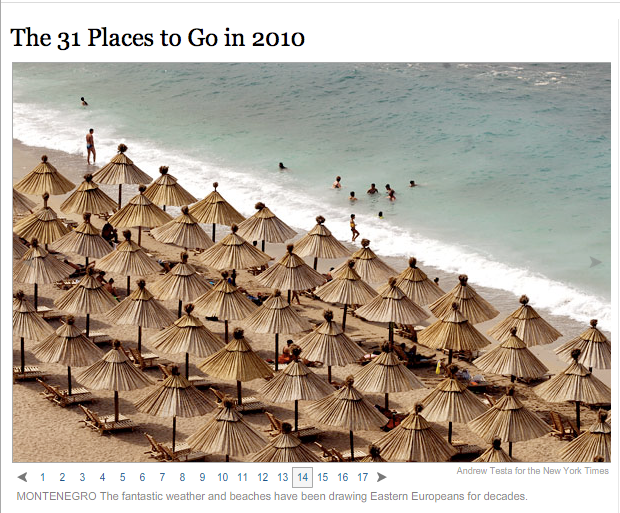 One in a series of rotating images on Apple's main page shows a story from The New York Times, entitled "The 31 Places to Go in 2010." In the image, a picture of a beach in Montenegro is shown. The picture is part of 17 images displayed at the top of the story in Flash. When accessing that same page on an iPhone, the images do not load. Instead, it says "In order to view this feature, you must download the latest version of flash player here," with a corresponding link. It's likely the iPad photos are simply renderings of the device, rather than actual screenshots taken of the Web sites. For example, the URL bar for the Times Web site simply shows "http://travel.nytimes.com" rather than the address for the actual story displayed. This week, Adobe spoke out in criticism of Apple when Jobs' live presentation showed Flash did not work on the new multitouch iPad. Writing on the company's official Flash blog, Adrian Ludwig said "Apple is continuing to impose restrictions on their devices that limit both content publishers and consumers." "Unlike many other ebook readers using the ePub file format, consumers will not be able to access ePub content with Apple's DRM technology on devices made by other manufacturers," Ludwig wrote. "And without Flash support, iPad users will not be able to access the full range of web content, including over 70% of games and 75% of video on the web." He went on to note a number of popular Web sites that iPad users will not be able to access without Adobe Flash, including Hulu, ESPN, Farmville, and Disney, of which Jobs is the company's largest shareholder. And yet Apple's Web site shows Flash content loading on the iPad, even when Jobs' live demonstration did not. 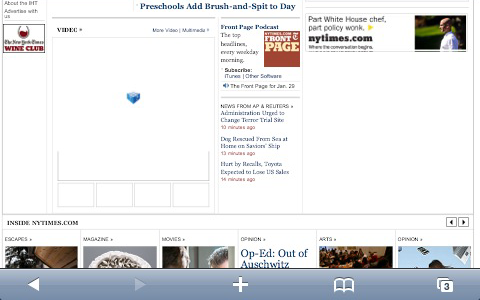 A Flash-based slideshow on The New York Times Web site, as seen on a Mac. 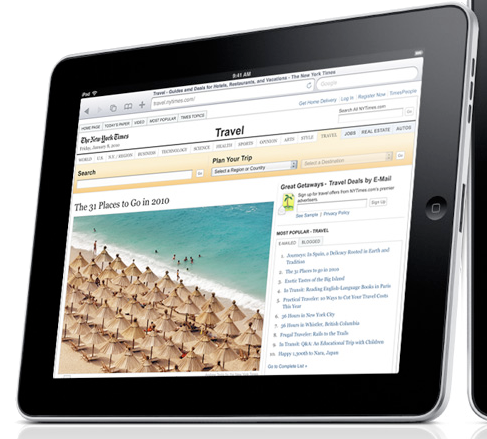 The iPad promotional image shows the Flash slideshow loaded in the browser. The same slideshow will not load on the iPhone Safari browser. 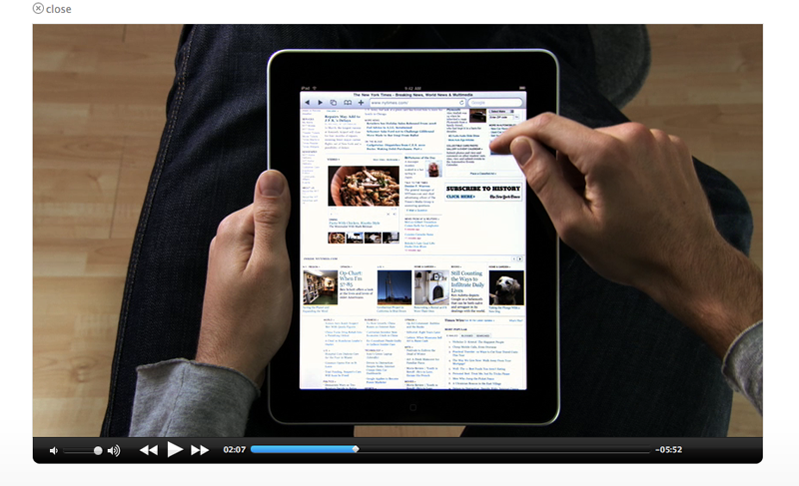 In yet another example, the promotional iPad video featured on Apple's Web site shows the Times video player loading on the iPad's Safari browser. 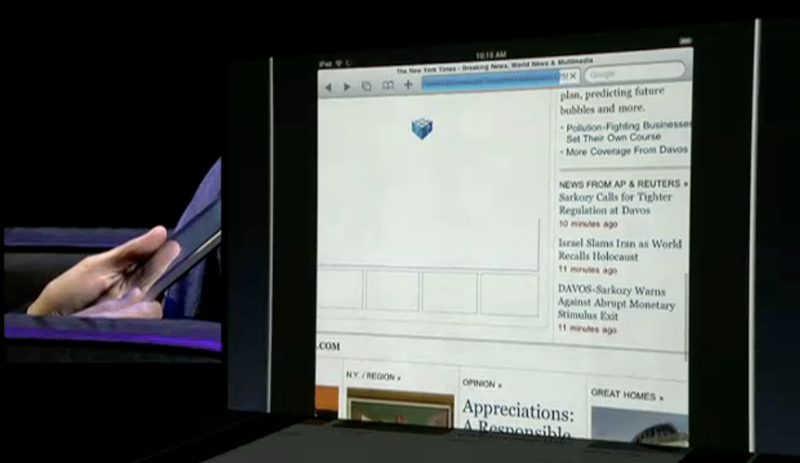 But that very same feature of the Web site did not load when Jobs did his live onstage demonstration. 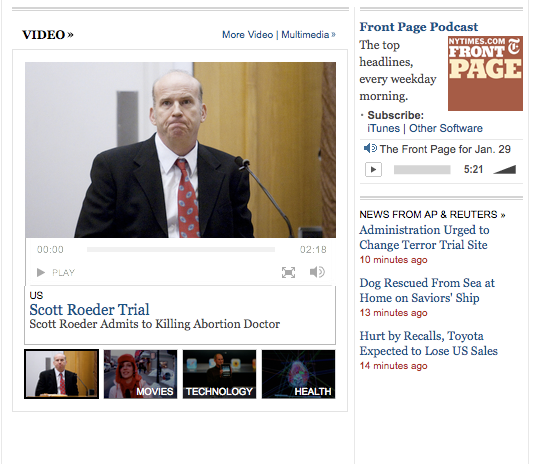 The New York Times front page Flash video player on a Mac. Apple's promotional video shows the Flash video section load just fine. The video section did not load in Steve Jobs' live demonstration. The video section does not load on an iPhone. While Adobe has pushed for years to have Flash on the iPhone since it launched, Apple has not budged. The company's rejection of Flash and move towards alternatives such as HTML5 suggest the Web plugin will not likely appear on the iPad. For more on why Apple isn't likely to support Flash in the iPhone OS, read AppleInsider's three-part Flash Wars series.